Treehouse at the Beach- the Zen Beach Experience! SPACIOUS AND UNCLUTTERED, the colorful rooms of The Treehouse are an invitation to relax, unwind and recharge. Enjoy the ambiance of a tropical paradise in the midst of a serene forest and island setting. A quiet refuge for contemplation, introspection and study; The Treehouse is your home-away-from-home. Our poolside lounge is the perfect place to view beautiful sunsets and enjoy hors d'oeuvre's. Surrounded by quiet neighborhoods, your peaceful enjoyment of time at The Treehouse is priceless. Golfers can be on several winning courses within minutes. Guests of The Treehouse may use the parking pass for Myrtle Beach and Huntington State Parks so you can drive to the beach and not have to worry about a parking space. MB State Park is only 5 miles away and features a nice fishing pier; Huntington is an 11-mile drive and features the Spanish architecture of Atalaya, romantic site for many weddings and events. Both parks are oceanfront with ample parking, picnic areas, clean restrooms, and beautiful walking trails through forests and beside fresh water lakes- a bird watchers paradise. Local restaurants feature seafood, Thai, fusion or a gourmet twist to Southern cooking OR you can enjoy a culinary adventure of your own design in the Treehouse kitchen equipped for a gourmet chef. History buffs, photographers and garden lovers would enjoy an adventure at Brookgreen Gardens ANY time of the year. The calm and peaceful atmosphere of The Treehouse may be the quiet place you want to curl up with a book from its private collection or enjoy meditative time away from all the hustle-bustle of the main beach traffic. Centrally located in an intimate condo community your options are abundant for a GREAT vacation experience, whether you seek tranquility or adventure! A ZEN beach experience is awaiting you at The Treehouse at the Beach. 'In Season' rental week runs from Saturday to Saturday. As an avid gardener and nature lover I fell in love with this cozy home at first sight. The view from the sunroom was like being on a tropical island. I lived here for almost 2 years when making some life changes and it was my sanctuary and a healing place that inspired creativity and refreshed thinking. It fulfilled my need for a peaceful place to slow down, relax and regroup. The location of the condo is so convenient to shopping, restaurants and golfing. Situated between Business 17 and ByPass 17, I can be in Myrtle Beach or Murrells Inlet in 15 minutes. The neighborhoods that surround this area are beautiful, quiet and a great place to walk or ride bikes. I love sitting at the pool with neighbors to watch the sun set. The pool deck and grilling patio are perfect places to socialize outside and the spectacular sunsets and cloudscapes provide a different artistic canvas every evening. I call this home 'The Treehouse' because of the incredible 3rd floor view of the palm and pine trees, pool and lake. It reminds me of my childhood treehouse and the sheer enjoyment of being in the woods. The atmosphere of this property inspires the simplicity of youthful living filled with wonder, curiosity and joy. I hope you will enjoy this home-away-from-home. I am happy to share the peaceful and healing atmosphere of the Treehouse with people that need to relax and recharge! THINK AND LIVE YOUNG! Wide genre of music CD's. Private pool for residents of South Bay East. Umbrella tables, chairs and lounge chairs for sunbathing and poolside restrooms. Ceiling fans in all rooms, Cathedral ceiling in Living/Dining/Kitchen, Hair Dryers in each bathroom, Iron and Ironing Board in laundry room. Although the property was a bit dated, it was clean and well equipped with whatever one might need including an outdoor grill and table. The nearby lake had geese, ducks, turtles and swans. The Presbyterian Church across the street welcomed visitors , and the AA meetings held there throughout the day filled the needs of many. The unit required climbing two flights of stairs which could discourage some as well as noise from vehicles that had compromised mufflers early morning. Otherwise, I liked its location near everything including the ocean,library,volunteer opportunities , Brookgreen Gardens, and the State Park. The owner was very approachable and co-operative quickly addressing all requests. Great apartment, it looks just like the pictures. We felt like we were at home and could relax and enjoy our time there. Patti was easy to communicate with and very helpful. Will stay there again! First family trip in a while. Condo was clean and welcoming. Neighbors were kind and well informed. Short distance to a beach were there is endless to do. A perfect location between Myrtle Beach and the South Strand. Close to all attractions and beaches, but not so overwhelming with noise and traffic. 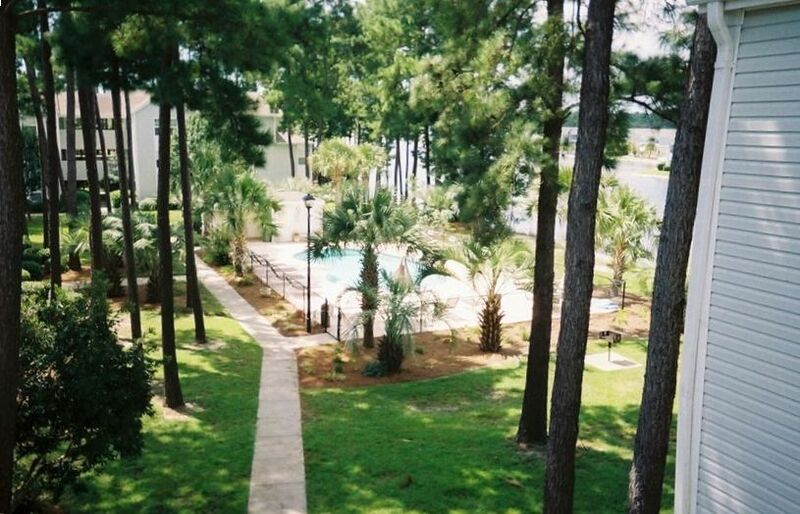 Large clean swimming pool, tree-lined covered parking area, and an adjacent natural lake surrounds the area. Free state park passes compliment your vacation. Surfside Beach family restaurants are excellent and are moderately priced. I recommend the Dolphin Tour, at the Crazy Sister Marina in Murrells Inlet, a 2-hour boat tour fun for the whole family. The condo is well appointed and well equipped for a family vacation, all the comforts of home. I recommend this unit wholeheartedly. I will be returning next year. Thank you, Patti. The apartment was immaculate and what we really liked was that it actually felt like a home rather than a sterile set of empty rooms. The décor was perfect for us, from the pictures and ornaments down to the bedlinen. Patti was always on hand if we needed her, which was nice to know when something unexpected crops up. The State Park permit was so useful we went to both parks making an extra visit to Huntingdon Beach to do some cycling. Close to anything, and everything. The owner was helpful and as kind as she could be. Not one complaint about anything. Will be staying there again as long as she owns it. Once again, on behalf of myself, wife, daughter, grandkids... Thank you so much. Unit has a parking pass to the Myrtle Beach State Park (appx 5 miles from condo) and a pass to the Huntington State Park (appx 10 miles away). Both State Parks are ocean front, have ample parking, public restrooms, picnic areas and walking trails. Myrtle Beach State Park has a pier. Mr. C's Bicycle Shop, Business 17, Surfside Beach rents bicycles by the day or week for a very reasonable price. (5-7 minutes from The Treehouse. Surrounding neighborhoods are calm and peaceful and a great place to cycle. I used to cycle to my choice of 3 grocery stores and carry home two bags of groceries in my backpack. The library is a little over a mile away and the journey through the peaceful neighborhoods is so enjoyable. A playground in a shady park with swings and slides joins the Surfside Library property. Well-maintained public tennis courts are also located by the Park and Surfside Library. Guests must be over 21 years of age. Person signing Rental Agreement must have a valid drivers license. NO PETS are allowed. Violations to these policies will result in immediate termination of rental with no refunds.